Have you ever had a goal but just not known how to reach it? 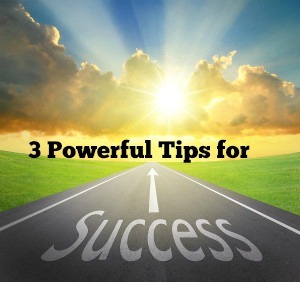 Today I’m going to share three easy to implement tips for reaching success. You can apply these to any goal you have – no matter how big or small. Tip #1: You don’t need to know how you will reach a goal. So first of all, when you’re setting yourself a goal, don’t put any limitations on yourself or worry how you are going to get there. Set your goal and simply start visualizing owning it, to get in the frame of mind for success. By doing this, you're training your mind to recognize unknown or hidden opportunities that are available to you right now. Tip #2: Take action now because any action is the right action. It's human nature to want to do everything exactly right the first time. Luckily, taking any action towards your goals will create momentum and progress. I like to think of actions like steps. Each step you take will bring you that little bit closer to your final destination. Taking these steps will empower you and keep you focused on your end result. Not only that, you’ll feel a sense of achievement for each little step you take, encouraging you to take the next one. So what’s a good first step to take? Anything! Listen to audios, read a book, find a mentor, enroll in a class, use Google to find information, join a forum…do ANYTHING to move you closer to your goal. Take confident action. Even small steps will bring you a lot closer to hitting your mark. Tip #3: Know that success is guaranteed. The truth is, there’s always a way to achieve your goals. Decide, “I will succeed. Failure is not an option.” Repeat this whenever you are having doubts. Every time you repeat it, you make it become your personal reality. The only way you can fail is by giving up. The trick is not to focus on failures or stress because that only attracts negative energy. When my husband and I decided we were going to create our own business, failure was never an option. It didn’t matter what was thrown in our way. Giving up never even crossed our minds. No matter what happens, always ask yourself, “How do I get around this?” instead of letting doubts creep into your mind. There will always be obstacles with any new venture, but you can handle them. With the Law of Attraction, you're equipped to achieve anything.